As you walk into the foyer, hosts will greet you. 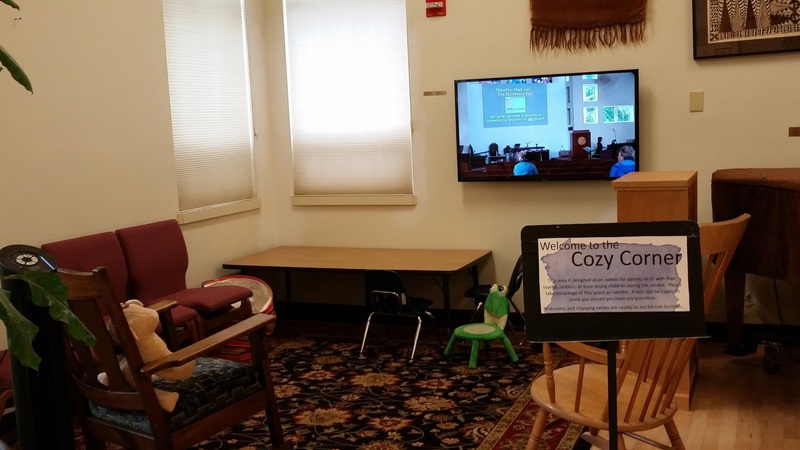 Hosts can direct you to the Visitors’ Table for an optional name tag, to the RE wing for children’s religious exploration and the nursery, and provide information about happenings today. You can ask for general information about our congregation and sign up for our newsletter, if you wish. If you need hearing assistance, ask a Host for the location of the sound booth. As you enter the sanctuary, a host will offer you today’s program. Go in and sit down where you are comfortable. A Host can help you find a seat if the service is crowded. Our minister, Rev. 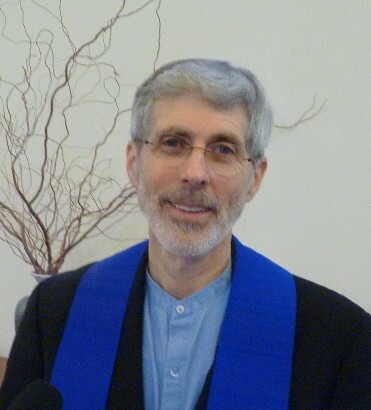 Rick Davis, usually conducts the service, but we may have visiting speakers. The service is assisted by a congregation member called the celebrant, and by a person at the sound/AV booth called the anchor. During the summer months, most of the services are led by members of our congregation or special speakers. Prior to the service start, there is usually a musical prelude playing in the sanctuary, which gives the congregation a few minutes of quiet time before the service. Our service starts with a singing bowl, and a centering thought for this particular day. After a welcome by the celebrant or speaker, we light three chalices. The flaming chalice is a symbol of Unitarian Universalism. An opening song and welcome begins the service. Later in the service, we sing the children and their teachers out to their classes through a “love arch” which we make by arching our arms over the center aisle. When the children have gone, we have our ritual “candles of joy and concern”. A member of the Lifelines Lay Ministry will read those concerns that were written in a book in the foyer. If there is time, they may invite persons up to share their concerns or joys. With each concern or joy, a candle is lit and placed in the special sand-filled container. We always light one candle for unspoken joys and concerns at the end. This ritual may be replaced with a shorter ritual, where the minister invites the congregation to call out names or situations that are of joy or concern to them. The sermon or presentation is next, usually about 20 minutes. Sometimes this is followed by a short meditation time and/or a question session. A short reading follows, and music is played/sung during the offertory, as ushers pass the basket. We “Share the Plate” with a specific community non-profit or UUCS ministry each month. We invite everyone to bring donations for the Marion-Polk Food Share to place in a basket at the front of the sanctuary, after the offering basket passes. A fellowship hour immediately follows each service, with coffee and tea served in Hanneman Hall. Sometimes, food is offered as well, and we hope you will stay and partake. Congregational groups, such as Social Justice in Action, Microfinance, or Religious Exploration have tables set up with information to share. Please stay and let us get to know you. 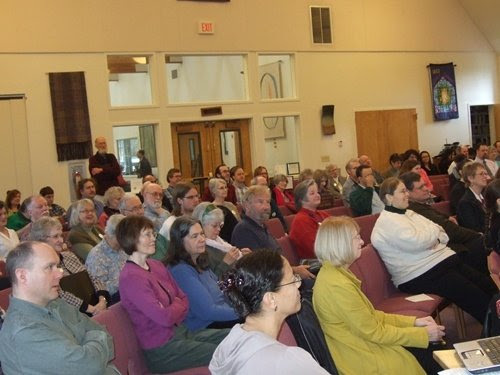 Newcomers may wish to visit the Welcome Table where members are looking forward to meeting you and sharing information about our congregation and what it means to be a Unitarian Universalist. A ritual for the fall in which members bring real or symbolic water to combine in a large container while they verbally share what it represents in their lives during the summer or the past year. A springtime ritual communion in which congregation members bring a flower for a large bouquet, and then take a different flower home, symbolizing a sharing of talents and gifts in this congregation. A ceremony for middle school youth who have completed a program of study with a mentor to create their own personal credo. Each makes a presentation of their credo in front of the whole congregation. This is usually held in May. A service planned and carried out by the high school youth, usually in the late spring or early summer. A ceremony for young children in which the congregation, minister and the parents affirm their commitment to help in the spiritual growth of the child. A ceremony in which new members officially become members and are welcomed to the congregation.